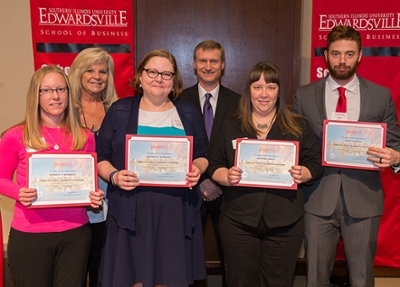 The Southern Illinois University Edwardsville School of Business celebrated 100 scholarship recipients at the 13th Annual School of Business Scholarships and Awards Program held Wednesday, March 22 in the Morris University Center’s Meridian Ballroom. The School recognized record donor support with scholarships worth approximately $175,000 for its best and brightest students pursuing degrees in accounting, business administration, computer management and information systems, economics and finance, and marketing. 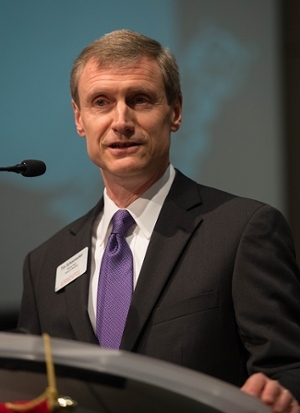 School of Business Interim Dean Tim Schoenecker expressed his appreciation to the generous donors who play a crucial role in student success. He gave the scholarship recipients two assignments. Ryan Price, BS ’13, MS ’14, a quantitative analyst with Aggio LLC and lecturer in the Department of Economics and Finance, provided alumnus remarks. Price emphasized the impact of scholarship recognition and the success that can be attained through the continuous pursuit of knowledge. Annually Enterprise Holdings provides an award to the top School of Business Student Organization of the Year. For the first time there was a tie, and the company awarded $1,000 each to Beta Alpha Psi and Delta Sigma Pi. A new award this year was the William E. Baker Memorial Scholarship for Business, sponsored by Sherry Baker. Five students were honored with the award, including Patricia Bourbon, of Roxana, Whitney Cates, of Mount Vernon, Amanda Endicott, of Highland, Adam Gaxiola, of Swansea, and Heather Grieve, of Collinsville. The Rotary Club of Edwardsville Scholarship was presented to Maggie Doolin, of Edwardsville. This marked the Club’s 10th year providing an award. Additionally, four students earned the Delta Sigma Pi Key Award for achieving a 4.0 GPA, including Katie Finnigan, of Waynesville, Kristina Ingold, of East Peoria, Tanner Ridings, of Morton, and Lucas Whitehead, of Flora. The William E. Baker Memorial Scholarship for Business, sponsored by Sherry Baker (back), who stands next to School of Business Interim Dean Tim Schoenecker, was presented to (Front L-R) Patricia Bourbon, Amanda Endicott, Heather Grieve and Adam Gaxiola. Recipient Whitney Cates is not pictured.